Whether during times of armed conflict or in the aftermath of disasters, the prevalence of sexual violence and gender-based violence is a critical humanitarian issue that requires attention and action. In harnessing its distinct elements and the capacity to implement practical responses, the Movement can add its clear and credible voice to calls to recognise the total unacceptability of sexual and gender-based violence during times of humanitarian emergencies and to find clear steps to reduce and eradicate this predictable and preventable problem. In armed conflict and other situations of violence, international humanitarian law and human rights law prohibit sexual violence against women, men, boys and girls. The Conference is the ideal forum not only to remind States of the strict prohibition of such acts, in particular under the Geneva Conventions and their Additional Protocols, but also to provide evidence of a range of other domestic mechanisms States need to address to deal comprehensively with this pressing humanitarian problem. The development of an agreed resolution, based not only on a rigorous legal analysis but also the operational experience of the Movement components in addressing sexual violence in situations of conflict and violence and providing assistance to victims, will mark the next necessary step on the journey to ensure dignity for all during humanitarian emergencies. During and in the aftermath of emergencies including disasters, public health emergencies and displacement, gender-based violence is very rarely highlighted as an issue. If attention is paid to the issue, it often focuses on sexual violence, rendering invisible other forms of violence including early marriage, trafficking, domestic violence and sexual exploitation and abuse. This lack of attention to gender-based violence in emergencies reduces funding for critical prevention and response efforts. In emergencies, gender-based violence increases due to a combination of shocks including the collapse of community and institutional protective systems, disruption of services, including health and justice, and community life, the destruction of infrastructure, separation of families, displacement, increased individual and community stress and crowded and insecure environments that present opportunities for people to misuse their power. 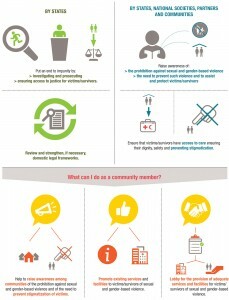 People subject to structural inequalities and with pre-existing vulnerabilities to gender-based violence incur compounded risk: suffering the emergency and its consequences, the risk of gender-based violence and stigma and a lack of care, protection and appropriate services if and when they try to get help. The Conference reviewed the results of research and consultations by the International Federation, which took place earlier in 2015. The research aimed to identify the most important risks and protective factors related to gender-based violence in disasters in order to facilitate an understanding of how to create an enabling environment that reduces the risks of such violence in disasters and how to shape efficient humanitarian action in this area. The research findings respond to a knowledge gap in this area and provide an evidence base for the humanitarian diplomacy efforts of the IFRC and National Societies to advance sector relationships and dialogue with national governments and national disaster management authorities (NDMAs), as well as action by Red Cross Red Crescent staff, volunteers and others. A resolution was adopted and gives the International Federation a mandate to work further on this topic and report back to the 33rd International Conference in 2019. What conclusions did the 32nd International Conference reach on the subject of sexual and gender-based violence?